Harborside Health Center’s two dispensaries have served more than 100,000 patients, and after federal agents raided Oaksterdam in April, 2012, Harborside became the government’s next target that July. Melinda Haag, U.S. Attorney for the Northern District of California, sent paperwork stating that the federal government planned to seize Harborside’s two locations, one in San Jose and one at 1840 Embarcadero in Oakland, because of their roles in distributing marijuana, which remains illegal under federal law. If successful, the forfeiture will shut down Harborside’s branch in Oakland, allowing the federal government to seize the property and bar any continuing business. So far, that legal battle is still ongoing; DeAngelo has been adamant from the beginning that Harborside will remain open, and the organization is continuing to operate at full speed while he contests the government’s charges in court. The city of Oakland has also joined the battle, responding to the forfeiture attempt by filing a complaint in United States District Court last October, which sought to stop the federal government from seizing Harborside’s Oakland location, and to defend local ordinances allowing dispensaries to operate within the city. The legal action against Harborside and the federal raid at Oaksterdam illustrate the national confusion regarding the legality of medical marijuana, as well as the disconnect between how dispensaries are treated in cities that encourage the pot industry, and how they are viewed by the federal government, which considers them lawbreakers. While medical marijuana is legal in California thanks to 1996’s Proposition 215, it remains illegal under federal law, regardless of any state or local laws directing otherwise. The federal Controlled Substances Act currently classifies marijuana as a Schedule 1 drug, meaning that it has a high potential of being abused, has no currently accepted medical use for treatment and has no accepted safety guideline for use under medical supervision. Even if a city’s government is regulating its medical marijuana industry—as Oakland does—the federal government can theoretically intervene at any time. 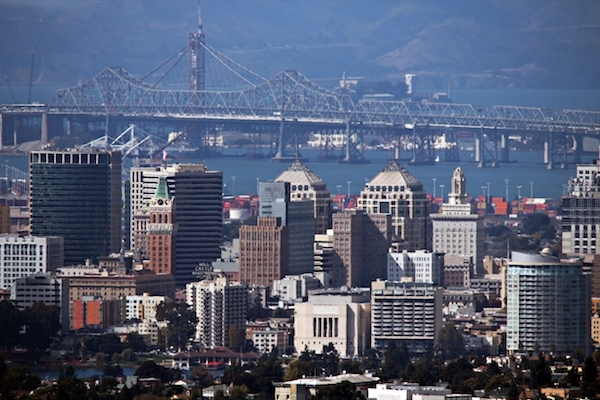 Oakland’s medical marijuana industry has had longstanding support from city officials. In February, 2004, the city granted licenses for four medical dispensaries to start business. Harborside opened in 2006. Oaksterdam opened a year later, in November, 2007. By 2008, Oakland’s dispensaries were bringing in almost $20 million dollars in revenue. Nearly 80 percent of Oakland voters approved Measure F the next year, which authorizes the city to impose a 1.8 percent tax on cannabis business activity, the first marijuana tax of its kind in the nation. In 2011, the city also revised its dispensary ordinance to double the number of permitted dispensaries within the city from four to eight. State and federal laws regarding pot can be confusing to dispensary owners and patients alike, because they often clash with each other and with local regulations. The Medical Marijuana Program Act, which was signed into law in California by former governor Gray Davis in 2003, added several clarifications to Proposition 215 and established the basis for the state’s medial marijuana program. Under state guidelines, a patient or caregiver can’t possess more than eight ounces of dried weed per patient, and no more than six mature or 12 immature plants per patient. But cities or counties are free to either retain these guidelines or enact their own. Oakland, for instance, allows 72 plants in a maximum 32-square-foot indoor growing area. For outdoor growing, this maxes out at 20 plants, with no area limit. Oakland law also allows three pounds of dried marijuana per patient. Dispensaries that serve four or more patients are allowed up to six mature plants, 12 immature plants and a half-pound of pot per patient at a time. Under the Medical Marijuana Program Act, if a patient feels the amount of marijuana prescribed to them isn’t enough to meet their needs, they can increase their dose to an amount consistent with their medical issue, as long as their doctor authorizes the increase. But the legislation also states that patients can still be arrested if police feel as though they are operating outside of the law by distributing or harvesting large yields of pot or by dealing illegally. A lot of marijuana users are misinformed about what the law permits for growing, transferring and distributing marijuana to dispensaries, said Kali Grech, a criminal defense attorney for Pier 5 Law Offices, who teaches classes at Oaksterdam about patient rights and medical marijuana laws. Many think the law is much more liberal than it really is, she said. “Because it’s a low burden for cops to prosecute, a lot of patients get busted and think they have immunity from arrest, but medical marijuana laws are really an affirmative defense to these charges,” Grech said. For example, Grech said, a patient ID card might grant a person access to medical marijuana, but anyone, whether they have a patient ID card or not, can be arrested if police have a reasonable doubt that their marijuana use is lawful. Hypothetically, police can arrest anyone on the street for smoking pot—they might not know they are arresting a card-carrying patient. It won’t be until that person goes to court for a preliminary trial that they can present evidence to show they were in compliance with local and state laws. Sometimes, Grech added, a trial can start at least 60 days after the initial arrest, so that person still might have to spend money posting bail and paying for legal counsel—only to testify in court that they were following the law all along. According to DeAngelo, Harborside operates by the books under both California and Oakland laws, and only customers with a current prescription from their doctors can register as patients. In fact, DeAngelo and some city officials say that running a dispensary actually cuts crime, because it discourages illegal dealing. Harborside pulls well over $20 million in revenue a year—basically out of the underground drug economy, he said. If the dispensary is forced to close, he claims thousands of people might have to resort to illegal street-level drug deals. Medical marijuana advocates argue that they’re providing a valuable health service, as marijuana can be prescribed for alleviating the symptoms of a variety of conditions, from multiples sclerosis and epilepsy to migraines and depression. Harborside’s medicinal menu includes flowering marijuana strains like Blackberry Kush, Purple Cadillac, Chem Dawg, Deadhead OG and Ken’s Grand Daddy Purple. They also sell concentrates like Afghani hash, Lavender Haze Full Melt, and Red Stomper Amber Glass; and edibles in the forms of butters, caramels, cookies and chocolates. Patients can also purchase topical salves and lotions (which provide medicinal benefits without the effects of feeling stoned), in addition to seeds and clones for personal growing. The center also offers delivery services, growing classes and holistic treatments like yoga, reiki, hypnotherapy and substance misuse support. For patients in need of medical marijuana who can’t afford it, Harborside also supplies free weekly care packages, provided that patients can document their current income level. Over the past four years, Harborside has donated over $643,000 in free medicine to low-income patients, its website states. Senior citizens and veterans also receive discounts. Harborside also works with Steep Hill Lab, an Oakland-based cannabis testing facility, to screen all of its flowers and concentrates for safety and potency. The dispensary’s marijuana supply is tested for the presence of pathogenic molds, which can be a threat for patients with compromised immune systems. They also test products for potency, which is measured by the amount of three cannabinoids—THC, CBD, and CBN—the chemical components found in marijuana, so that patients can pick their preferred strain before buying based on its chemical makeup. But the federal government sees dispensaries as potentially more harmful than helpful. The legal maneuverings that led to Harborside’s attempted seizure began on October 7, 2011, when California’s four U.S. Attorneys announced they were coordinating a large-scale legal enforcement effort against commercial medical marijuana enterprises up and down the state. “That industry has swelled to include numerous drug-trafficking enterprises that operate commercial grow operations, intricate distribution systems and hundreds of marijuana stores across the state — even though the federal Controlled Substances Act makes illegal the sale and distribution of marijuana,” a press release from the DEA released in October 2011 states. Statewide enforcement efforts soon encompassed three categories: civil forfeiture lawsuits against properties involved in alleged drug trafficking activity (the kind of legal action brought against Harborside); warning letters being sent to owners and lienholders of properties housing dispensaries; and criminal cases targeting commercial marijuana activity. That same month, the Internal Revenue Service also sent a $2.5 million bill for back taxes to Harborside, arguing that the dispensary could not deduct many otherwise normal business expenses because it sells what the federal government considers to be controlled substances. Immediately following receipt of the forfeiture notice, DeAngelo made it clear that Harborside would stay open and fight all efforts to shut it down, even after Harborside’s landlord, Ana Chretien, started eviction proceedings, arguing that the business had violated its lease by breaking federal laws. Harborside contested the eviction in court, and in December, Alameda County Superior Court Judge Evelio Grillo ruled that because the property’s lease made it clear that the location would be used as a dispensary, Chretien could not use state courts to enforce federal law against a business otherwise sanctioned in California. That October, the City of Oakland also joined the fight by filing a complaint in U.S. District Court seeking to prevent the forfeiture, marking the first time a city has sued the federal government for targeting licensed marijuana facilities. The city asked the court to declare the federal government’s attempts to shut down Harborside unlawful, arguing that it would have a chilling effect on Oakland’s pot industry, and that the government acted too late in filing its forfeiture notice. A federal statute of limitations maintains that civil forfeiture actions cannot be filed more than five years after a dispensary has been in operation; at the time of the filing, Harborside had been open for six. In January, 2013, Chief Federal Magistrate Maria-Elena James denied motions from Harborside’s landlord, who was hoping to enact an immediate stop on all medical marijuana sales at the dispensary. In February, James also ruled that the city has no standing to block federal attempts to shut Harborside down, and that only the dispensary and its landlords can contest the government. The city is currently appealing the ruling. Some medical marijuana advocates believe the federal action against Harborside—and the Oaksterdam raid—have been symbolic attempts to show that the Obama administration won’t allow California to fully implement its medical marijuana laws. “Over the last year and a half, but more so over Obama’s entire administration, we’ve seen fairly aggressive attacks in medical marijuana states. California is one of the many states where the justice department has literally bullied local and state officials into suspending programs,” said Kris Hermes, media specialist for Americans for Safe Access. And unlike at Oaksterdam, where student course enrollment dropped significantly immediately following the raid, Harborside’s business boomed after the initial threat of closure. “We saw a noticeable uptick in patients who wanted a sufficient supply of lab-tested medicine in case we were closed down,” DeAngelo said. What’s different though, he said, is the level of anxiety in patients, especially among those who are disabled or afflicted with severe illnesses. “They are very, very worried that they’re going to close Harborside down and force them back to the streets,” he said. The federal government is attempting to close Harborside Health Center’s Oakland location on 1840 Embarcadero. Thanks Guys keep up the fight. From your friends and WECAN in Las Vegas.